A four-man tent is perhaps the best all-round tent for camping in. Whether you’re camping solo, as pair, or with your family, a four-man tent offers the right balance of size and portability, allowing you a spacious place to stay without having to carry too heavy a load. Should you have a fair amount of supplies to store, then you will always want to have room for an additional person to cover this. For example, if a couple were camping and each had a large kit with them, then a four-man tent is the best option to go for. A family of four probably won’t have much space to spare in a four-man tent, making them less suitable for families and large groups. That’s not to say they aren’t an option for four people, there will just be a lack of space that may make camping less enjoyable. However, given their affordability and the great selection of styles to suit different camping trips, buying a few four-man tents is a great option for group camping. Below are some of the best four-man tents currently available, so be sure to check these out if you are in the market for a new tent! The Coleman Ridgline is a four-man tent with ample space. Sporting a domed design, the tent offers plenty of room to stand, with the lounge area being spacious enough to fit tables and chairs if necessary. Sleeping four people in two separate bedrooms, it’s one of the more spacious four-man tents out there, with enough room to sleep four comfortably. This is helped by the fact there are two bedrooms and separate lounge area for storage. Speaking of storage, the tent also features several storage pockets to avoid over-cluttering, which can often be an issue when sleeping four people. So, in terms of spacious four-man tents, the Coleman Ridgline is up there with the best. The lounge area can be accessed at either side thanks to double-doors, and when left open you can create a pleasant porch area using the porch poles included. Should the weather not be up to scratch, the tent is very water resistant (up to 3,000mm), while the large vertical windows on either side of the doors allow for plenty of natural light. It also has some nice touches that make the tent that bit more pleasant. For instance, there is power cord vent if you need access to a power supply, while vents can be opened to provide enhanced airflow. The Vango Venture is a durable four-man tunnel tent that’s great for individuals and duos seeking a spacious tent. A family of four may feel space is tight as there is just a single bedroom, but the porch area is ideal for storing supplies so it can certainly sleep four people without much problem. Suitable for most types of camping, this is a versatile tent that will serve you well whether you’re camping at a festival, hill waking, visiting a campsite, or even out in your garden! It’s supported by strong and durable Vango PowerFlex fibreglass poles, which sturdy support even more adverse weather conditions. Additional ventilation is also featured throughout the tent, increasing overall airflow and reducing the chances of condensation. The tent’s PorTex 70D 3,000mm HH polyester fabric is highly water resistance as well, helping to ensure the tent never leaks and the interior remains dry in any conditions. Also, the ground sheet is linked in, so you needn’t worry about leakages coming in from the ground either. The inside also features lantern hooks, bug nets, and several storage pockets, which is great for keeping things tidy and setting up a nice interior for sitting in. A fastpack carry bag is also included to make transporting the tent much easier, and you can make it even more compact by pulling on the compression straps, with the over-sized opening making it easy to pack away. The CampFeuer Tunnel tent is another great four-man tent, although the inclusion of just a single person does mean it can be rather cramped with four people sleeping. However, it’s a great option for couples or duos that want plenty of space when camping. Most of the tent space is saved for the bedroom, which can sleep four but is better suited for two people with supplies. You can fit four, but because the lounge area features a separate groundsheet rather than a sewn-in groundsheet, it may not be the advisable to leave too much in the lounge area. Should the weather be fine, then you can really take advantage of the lounge space. There are two points of access to this area, including a large porch opening that can be supported with poles to create an open-place sitting area. You can even remove the groundsheet and feel the grass between your toes! Don’t worry if the weather doesn’t remain nice however. The tent is double skinned with a 3000mm HH rating, so it is highly water resistant should there be consistent rains during your trip. Thankfully, the bedroom section does include a sewn-in groundsheet, so this space will always be dry even in dreadful weather conditions. Pitching the tent is easy even if you tent to struggle with it, as there are clear instructions that showcase how to set it up quickly. A large carry bag is also included to make transporting the tent a piece of cake. Another great four-man tent from Coleman, the De Gama offers a great place to sleep four people, although the single room design may limit space. This area can be divided separated with a curtain divider if necessary, which may make sleeping four a bit better. The porch area is great for storing your supplies however, so sleeping four people is certainly possible without being too cramped. Perhaps one of the best aspects of the De Gama is how spacious it is in terms of height. Offering full-head height, most people can stand upright in the porch and bedroom area, helping to make the tent feel that bit bigger. The porch area is great for sitting inside of even if the weather takes a turn for the worse, as the sewn-in ground sheet should keep everything dry. This wet store area will certainly make life easier for rained-in campers, as you can store your muddy footwear here while keeping the rest of the tent dry. Don’t worry about leakages either, the De Gama flysheet is made from durable polyester with a highly water-resistant rating of 3000mm HH. It’s a tent that’s built to withstand the elements, which is certainly helpful for UK campers! Sturdy steel poles offer great support in windy conditions, and setting up the tent shouldn’t take too long, although there are many sections that need to be pegged down to make properly secure. Taking the time to do this properly results in one of the sturdiest four-person tents out there! For those that want to avoid the stress and handle of pitching a four-man tent, then the TFO Automatic Quick Pop Up Tent is worth checking out. It features a single room design so isn’t the best for sleeping four people, although it can be done if you don’t mind squeezing in! However, it’s probably the best not to pack four people in, as there will not be anywhere to store your supplies. While not an issue in dry climates where you can leave things outside, it may become a problem in wetter conditions. The main selling point here is how easy it is to pitch the tent. As it uses a popup design, it literally takes less than a minute to pitch and disassemble for seasoned campers, while novices can have it up or down in around 5 minutes. It even includes a rainproof cover for the roof of the tent, preventing any possible leaks at the top of the tent. The flysheet fabric is completely rain proof however, but this cover does offer some additional coverage should the rainfall be significant. 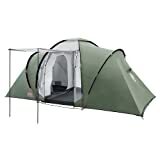 Given how easy it is to set up and how lightweight the tent its, this is a great choice for hikes, treks, and any trips where you will be on move frequently. As most portable tents tend to be much smaller than this many will appreciate the easy setup and portability of the tent. It also comes with a very reasonable price, which will appeal to those on a budget that want a reliable tent. Check out some of our other tent reviews. Read our best 2 man tents guide here , top family tents here, backpacking tents, Pop-up tents and 2 man tents. Are Canvas Bell Tents Worth Buying?